For Naomi Nachman, cookbook author and New York-based kosher food personality, the perfect meal means flavors that are fresh and balanced. 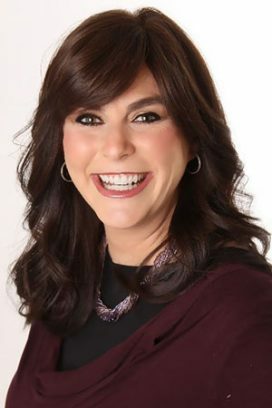 She is also the owner of The Aussie Gourmet, through which the Australian-born Nachman works as a personal chef, television and radio guest, and produces her own version of kosher “Chopped” competitions as a team-building activity for corporations. Home chefs may best know Nachman as the author of the best-selling Perfect for Pesach (2017). Her recent release, Perfect Flavors , riffs off the style and tone of that earlier recipe collection, but with a focus on the every day as well as holidays that span the entire Jewish year. (Tease: There’s a Hanukkah sufganiyot recipe below). Nachman’s everyday approach to cooking—one shared by many of today’s leading kosher chefs—is to incorporate as many exotic flavors as there are available to kashrut observers. In essence, she has travelled the globe and recreated her flavor memories for you, so that you, too, can enjoy Korean-inspired beef ribs, for example. A second principle, beyond global cuisine, is the art of hosting—one of Nachman’s greatest joys regardless of whether she is welcoming guests to her dinner table or she is the one invited out for a meal. In the event that she—and now you!—is the guest, she has developed what she considers the ideal contribution to any meal: Lotus Biscoff Cookie Butter Bars (which are actually pareve). And while Nachman is as innovative in her own realm as the latest round of kosher food writers and bloggers—she even collaborated with Real Life Kosher Cooking author Miriam Pascal, a friend of hers, on the book’s photography—the Perfect Flavors author makes a point to not push the limits as far as some others may (think fake bacon, for instance, which Nachman eschews). If you were wondering what this influencer on the New York kosher food scene is eating for dinner on any given night, it might just be the beer-glazed wings, bourbon-marinated steak, fish tacos or brisket fries from the new book. Which is fine by me, as long as there will also be enough of her glazed merlot chocolate cake and chocolate martinis to go around for dessert. Here, I’m sharing a rich, hearty onion soup perfect for winter, and—for Hanukkah—pareve Lemon Meringue Pie Doughnuts. Yum! Prepare the doughnuts: Sprinkle yeast over warm water; sprinkle in 1 teaspoon sugar. Let stand for 5 minutes until foamy. Blend yeast mixture, remaining 1/4 cup sugar, soy milk, oil, eggs, and salt with 2 cups flour. Gradually add remaining flour to make smooth, soft dough. Cover; let rise for 1½ hours. Punch dough down; let it rest for 10 minutes. Roll out the dough to ¼-inch thickness. Using an upside-down glass or cookie cutter, cut dough into rounds, 2-3 inches in diameter. Place on a floured surface; let rise again for 1/2 hour. Heat oil to 360° in a large pot or deep fryer. Carefully slide doughnuts into hot oil. Use an oil/candy thermometer to help keep oil at constant temperature; fry only 3-4 at a time, turning the doughnuts once, about 1 1/2 minutes per side. Allow to cool. Prepare the lemon curd filling: Whisk together all filling ingredients in a medium saucepan over low heat. Once combined, turn heat to medium low (don’t rush it or the texture will be ruined). Continue to whisk continuously for 10 to 15 minutes until mixture thickens AND curd reaches 180°. Use an oil/candy thermometer to ensure the right temperature. Remove from heat. Place pan into an ice bath, continuing to whisk until mixture has cooled. 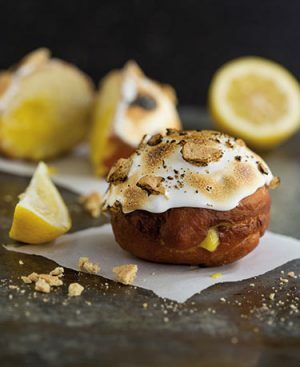 Use an injector or piping bag to fill doughnuts with lemon curd. Prepare the topping: In a microwave-safe bowl, melt Marshmallow Fluff for a few seconds, until soft enough to spread. Spread softened Marshmallow Fluff over doughnuts, then top with graham crackers. For nicest presentation, use a torch or broiler to brown the Marshmallow Fluff before serving. Recipes from Perfect Flavors, by Naomi Nachman, photographs by Miriam Pascal (Mesorah Publications). when you live in a community with a very small Jewish population flanken is not available. i love this recipe and would like to make it. can you give a substitute meat. thank you for your time and interest. If you live in a place where there are Korean restaurants or stores, they often use beef ribs that are cut just the way flanken is cut. But Google it to double check. I believe I read that in a Washington Post article, years ago. Also, you can ask a regular butcher or grocery store butcher to cut them for you, if you can describe the cut. 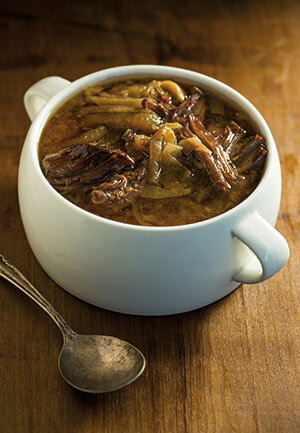 can the onion and flanken soup be made in a “regular” stock pot rather than a crockpot?